Allaahumma innee as-aluka ath-Thabata fil Amr, wal azeemata alar-Rushd, wa as-aluka Moojibati Rahmatika wa Azaaima Maghfiratika, wa as-aluka Shukra Ni’matik, wa husna ibadaatik, wa as-aluka Qalban Saleeema wa Lisaanan Saadiqa, wa as-Aluka min khairi ma Ta’lamu, wa Audhubika min Sharri ma Ta’lamu, wa astaghfiruka limaa Ta’lamu, Innaka Anta Allaamul- Ghuyoob. O Allaah verily I ask of You for strength of perseverance of obedience on the Deen, and determination in practicing of the Deen and goodness. 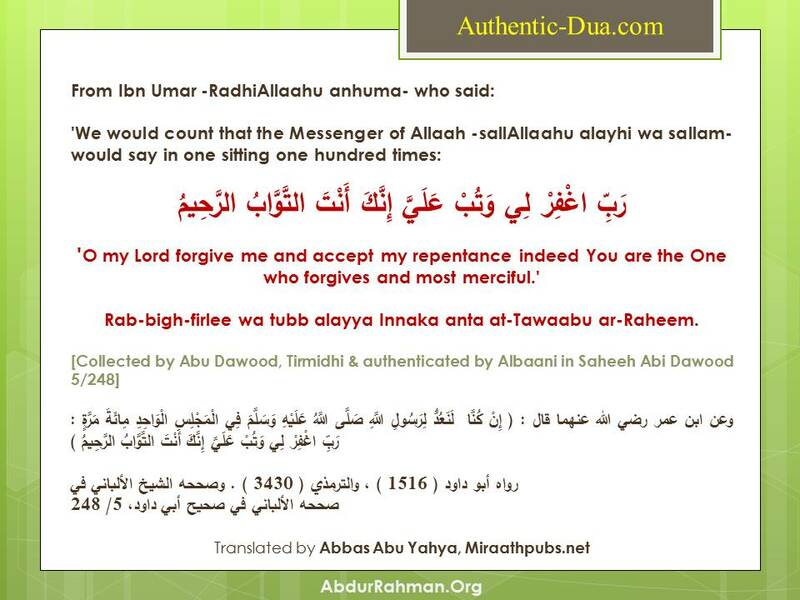 And I ask of You for that which obligates Your mercy and resolutions for Your forgiveness. And I ask of You for the capability to be thankful for Your blessings and to worship you in a correct and good way. And I ask of You for a heart which is purified in belief and free from desires and a truthful tongue. And ask of You for the best of what You know, and I seek refuge with You from the evil of what You know and I seek forgiveness for that which You know. Indeed You are the One who knows the unseen. Collected by Tabraani in ‘Mu’ajam al-Kabeer’ (7/335-336), Abu Na’eem in ‘al-Hileeyah’ (1/266), Ibn Aasakir in ‘Tareekh Damishk’. Albaani said this Isnaad is Jayyid, in ‘Silsilah Saheehah’ No. 3228. Translated by Abbas Abu Yahya. O Allaah, I ask of Your pleasure and for Paradise,and I seek refuge from Your displeasure and from the Hellfire. O Allaah forgive all my sins, the minute of them and the major of them, the first of them and the last of them, the ones committed secretly and openly. ‘Allaahumma innee as-aluka al – Jannah, wa maa qarraba ilayhaa min qawl aw ‘amal, wa Audhubika min an-Naar wa maa qarraba ilayhaa min qawl aw ‘amal. O Allaah, I ask of You for Paradise and that which brings me closer to it of statements or actions. And I seek refuge with You from the Hellfire and that which takes me closer to it of statements or actions.